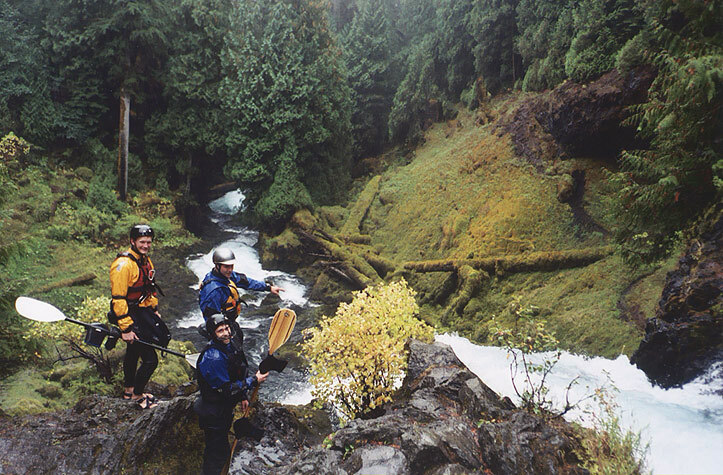 The McKenzie River near Eugene is a mainstay for Oregon paddlers, with year-round playboating in a heavily forested setting that has produced some of the finest paddlers in the world, including 2003 world champion Jay Kinkaid. 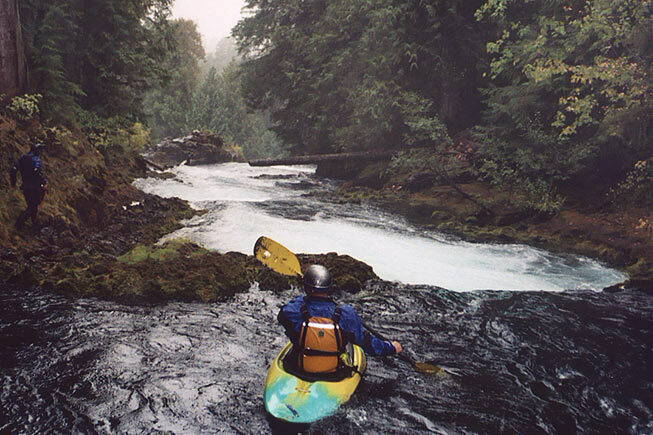 The Mckenzie is actually the first river I ever kayaked. I had no clue what I was doing but I thought kayaking might be fun, so I bought a huge Perception boat and drove up to Finn Rock. 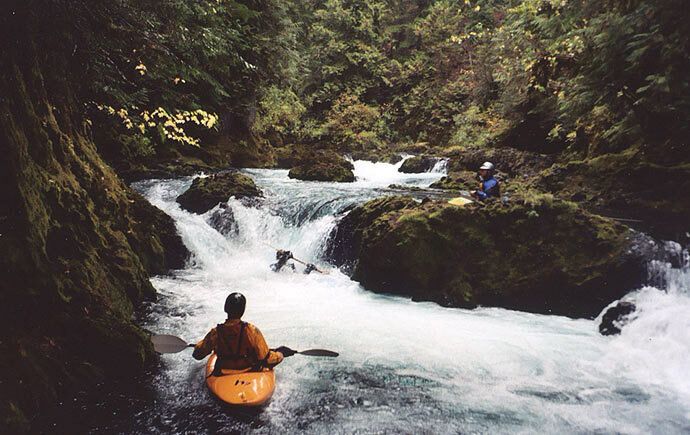 This was back before online whitewater forums like PDX Kayaker, so I had no way to meet any other boaters. I didn't even know that there were such a thing as Kayaking clubs or Kayaking classes. Of course, I didn't care, I just wanted to get in a kayak and see what would happen! There wasn't anybody else putting in at Finn that day and that's probably a good thing; I was sporting a bloated orange Bi-Mart PFD, 10-pound metal-shaft Prijon Paddle, and ultra-dorky helmet. I paddled straight into every hole on the river, got pounded a lot, took several very long swims (no roll of course..), and loved every minute of it! Somehow, I made it to the take out with all of my gear and I was hooked for life. Ah, those were the days.. When the first rains of the fall 2003 season started to fall I headed up on this section with Gabe, Jesse and Jon. We were on our way to paddle the upper-upper Deschutes, and figured we might as well run this on the way. 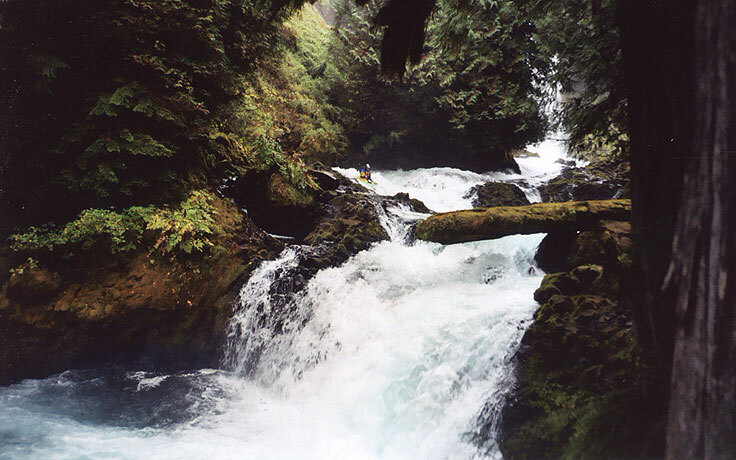 This section is rated class five because all of the rapids are packed between three class six drops: Two 80-foot falls and a 20 footer that pours onto logs. Swimming here is not an option! Prior to this day I had paddled every section of the Mckenzie except for this one. This run is very short and is essentially a novel alternative to hiking the trail along the river, but if you're passing through with a boat you might want to check it out (it runs year-round, so flows are not a concern). 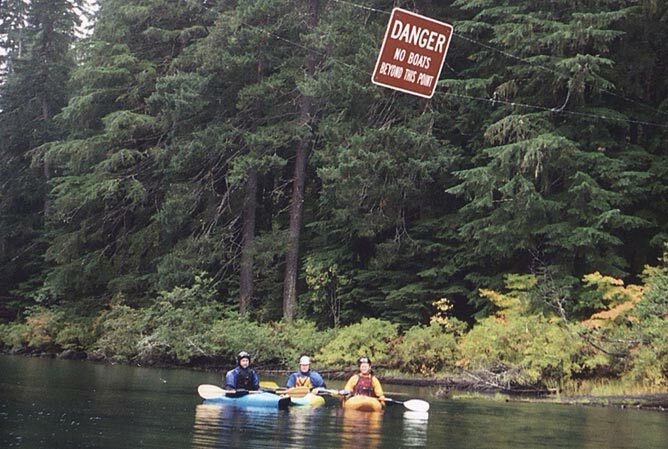 We put in at Clear Lake and did the short paddle across to where there was warning sign that signaled the start of the Mckenzie River. Gabe said on sunny days you can see an intact petrified forest below the water of the lake; I bet this would be a cool place to go diving! Breakin' the law.. breakin' the law..
Below the lake were some small drops and then a river-wide logjam with no real eddies above it. At high water this logjam would become exceedingly dangerous; as it was we literally hopped out of our boats in moving water and jumped up onto the logs when we got there..
Jon and Jesse look on as Gabe melts through a slot below the logjam. Most of the drops on the section above and below Sahalie Falls were like this, fun little class II-III slots and ledges. Gabe had run this section before, so I asked "How will we know we're near Sahalie?" as we headed downstream. "Well, we'll go around a corner and the hairs will stand up on the back of your neck." Gabe said with a grin..
Sure enough, we reached a clean 8-foot ledge with a runout below that disappeared over a gigantic horizon line.. we had arrived at the first big falls..
Jesse Coombs waits while Gabe sets safety below the clean 8-foot ledge. The monster horizon line downstream is 80-foot Sahalie Falls..
Sahalie Falls is an 80-foot drop that is very popular with tourists touring the Cascade Mountains. 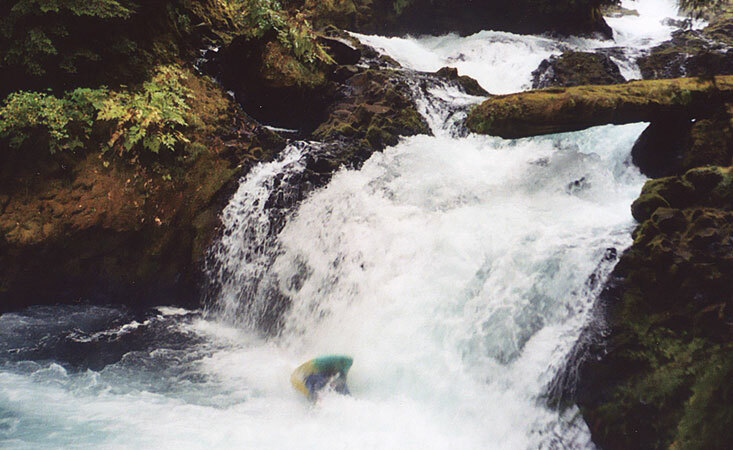 Shannon Carrol is the only person who has ever run this falls, and she briefly held the waterfall freefall world record until Tao's 100-footer in British Columbia. Shannon and some other boaters from the Southeast were playing at Redsides Hole on the lower McKenzie and decided to head upstream and check out this falls they had heard about. All of us agreed that if Sahalie were a 30 or ever 40 footer it would be run regularly, but it is just too big for most paddlers to sanely consider. Gabe also expressed doubts about the depth of the pool below the falls..
"It's so clean!" The ever-optimistic Jesse scopes out the line over Sahalie Falls. Our group, scouting Sahalie Falls, shot from below. The rapid immediately below Sahalie Falls is the only runnable class five drop on this section; this rapid is long and challenging and deserves a careful scout. The lead-in to this drop is long and twisty, dropping over a middle ledge into a fast pool which flows under a log sieve on the river-left side. At higher flows this sieve is very dangerous! The log that forms the sieve partially blocks the final drop, forcing paddlers to run the final ledge on the extreme right side. 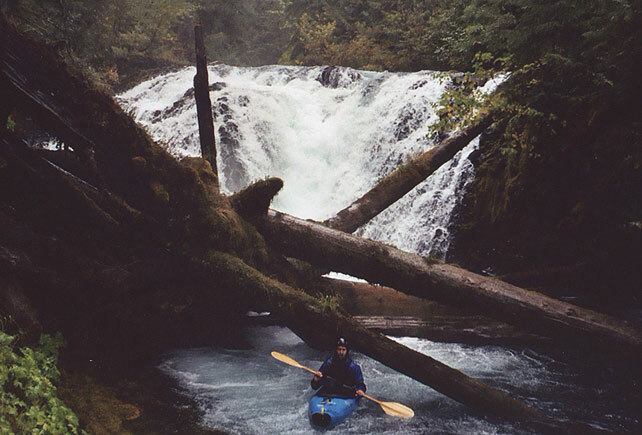 In the photo below, note that the log extending across the bottom ledge is only about two feet above the water..
Jesse battles his way out of the ledge-hole; he paddled away unscathed after a brief session in the hole..
Below the class five drop is several hundred yards of smaller drops, leading to a 20-foot falls that pours onto a pile of logs. Paddling this section at anything other that low flows would be extremely dangerous; the eddies would get scarce in a hurry! 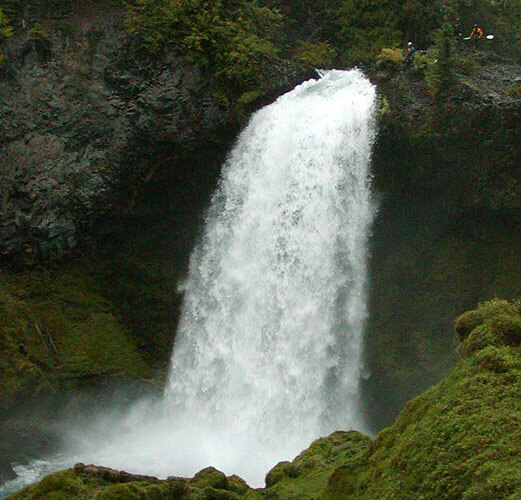 Just below the loggy 20'er is Koosah Falls, the second 80 foot drop on this section. We took out at this falls, not bothering with the loggy class II stuff downstream..
Koosah falls has also been run in a kayak, three times that I know of. This drop is not recommended, though, because the pool at the base of the falls is only 12 feet deep. I'll let you do the math on that one.. Directions: Drive to Clear Lake and put in there. Sahalie and Koosah are easy enough to find, just look for the National Forest signs on the highway. The class five drop can be scouted from the tourist overlook for Sahalie.